The Act abolishes the common law defense of reasonable chastisement in relation to corporal punishment. Parents and guardians have the primary responsibility for the care and protection of their children. While the role of parents is to protect their children, society also has a duty to promote the welfare and safety of children. Everyone should be alert to the possibility that children with whom they are in contact may be being abused or at risk of being abused. The wider community of relatives, friends, neighbours, professionals and voluntary workers are well placed to be aware of a child’s welfare. They should know how to recognize and respond to the possibility of abuse or neglect, so as to ensure that the most effective steps are taken to protect a child and to contribute to the ongoing safety of children. Whether you are a Jehovah’s Witness or not, and if you are living in the Republic of Ireland, you should always inform Tusla when you have reasonable grounds for concern that a child may have been, is being, or is at risk of being abused or neglected. If you ignore what may be symptoms of abuse, it could result in ongoing harm to the child. It is not necessary for you to prove that abuse has occurred to report a concern to Tusla. All that is required is that you have reasonable grounds for concern. The implementation of the Children First Act should be of keen interest to every active member of Jehovah’s Witnesses in the Republic of Ireland. Why? 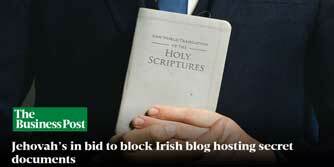 Because of how Irish Law has defined relevant services and mandated persons. A relevant service includes “Any work or activity as a minister or priest or any other person engaged in the advancement of any religious beliefs which would or could bring that minister, priest or other person, as the case may be, into contact with a child”. 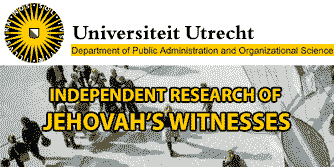 According to the January 15, 2008 edition of The Watchtower, Jehovah’s Witnesses “have always considered participation in the preaching work to be a matter of loyalty to God and a fundamental requirement of their faith”. In other words, all Jehovah’s Witnesses are engaged in the advancement of their religious beliefs. Jehovah’s Witness ministers are very likely to come into contact with children as part of their door to door preaching work and bible study courses. A mandated person includes people who have contact with children and/or families and who are in a key poistion to help protect children from harm. It includes a “member of the clergy (howsoever described) or pastoral care worker (howsoever described) of a church or other religious community”. The phrase howsoever described takes into account the fact that different religions have different means of interpreting “clergy” and “pastoral care worker”. The use of the phrase here is to indicate that the Act interprets the terms in the broadest of senses. All religious groups would do well to make note of that. Jehovah’s Witnesses may not have a “paid clergy” but they have “spiritually mature men who take the lead in the congregation” They “guide and help to the protect the congregation spiritually”. “They teach [members] how to do God’s will” and “take the lead in the evangelizing activity, working with … and training [members] in all features of the ministry”. Based on these descriptions of an elder, he is a member of the clergy (howsoever described). What about pastoral care workers? Who would fall into this category within Jehovah’s Witnesses? According to the January 15, 1996 edition of The Watchtower, “present-day elders do a pastoral, or shepherding, work for the benefit of the sheep of Jehovah’s pasturage.” Again, Jehovah’s Witness elders fall into this category. Do other members of Jehovah’s Witnesses fall into this category of pastoral care worker? According to Jehovah’s Witnesses policy letter, dated July 11, 2014, entitled Use of ministerial servants where the number of elders is limited, there are various times when ministerial servants fulfill pastoral activities that are normally reserved for elders. As it is possible for a ministerial servant to perform pastoral activities, he could be considered a “pastoral care worker”. In the Kingdom Ministry School 2018, ministerial servants are taught how to teach by means of public talks. As they teach other members of the congregation, it is not difficult to argue that a ministerial servant is also a member of the clergy. Could other members of Jehovah’s Witnesses be considered a member of the clergy or pastoral care worker ? In the footer of the website, JW.org, there is a link to Request a Bible Study. If a member of the public completes the online form, they will be visited by a couple of members of the Jehovah’s Witness community in their area. If the student requesting the bible study is female, they will be visited and taught by female members who will teach them using Watch Tower publications. Conversely, male students requesting a bible study will be taught by male members. Pastoral care, understood in the broadest sense, means to “help others”. In the May 15, 2014 edition of The Watchtower, it states, “Making return visits and conducting Bible studies requires diligent effort … By applying ourselves in the Kingdom-preaching work, we can help others to ‘come to an accurate knowledge of truth,’ and that can mean salvation for them”. As all Jehovah’s Witnesses preach to “help others to ‘come to an accurate knowledge of truth'”, it could be said that each active member of Jehovah’s Witnesses is a pastoral care worker. For the above reasons, Jehovah’s Witnesses in Ireland need to be more concerned with how they interpret and apply the Children First Act than any other religious group. This is especially true when one considers the fact that they are probably the only religious group who have children accompanying them in their preaching and teaching activity. If all Jehovah’s Witnesses could be considered mandated persons, what are their legal obligations? They are to (1) report harm of children above a defined threshold to Tusla; and (2) assist Tusla, if requested, in assessing a concern which has been the subject of a mandated report. It would be in the best interests of Jehovah’s Witnesses in the Republic of Ireland to address this legal issue to ensure the safety of the children within their community. They would leave themselves open to severe legal risk if any member of their community were to harm a child while engaged in any of their pastoral activities, such as bible study, preaching, teaching and kingdom hall meetings. Additionally, they would leave themselves open to legal risk if they did not meet their legal obligations as mandated persons. As a mandated person, one is required to report any knowledge, belief or reasonable suspicion that a child has been harmed, is being harmed, or is at risk of being harmed. The Act defines harm as assault, ill-treatment, neglect or sexual abuse. It covers single and multiple instances. If a mandated person receives a disclosure of harm from a child, they must make a mandated report of the concern to Tusla. Mandated persons are not required to judge the truth of the claims or the credibility of the child. If it doesn’t meet the threshold for mandatory reporting, then it should be reported to Tusla as a reasonable concern, which is a requirement for all persons. Jehovah’s Witness elders have been provided with very little training on how to deal with child abuse by the governing body of Jehovah’s Witnesses. Their latest policy on child abuse provides no practical suggestions on dealing with the subject sensitively and professionally. Furthermore, in the section entitled Protecting Minors From Abuse as part of the 2018 Kingdom Ministry School, Jehovah’s Witness elders are being trained, not on how to handle child abuse, but how to read and understand a child abuse policy. There is more direction provided in the elder’s shepherding textbook, Shepherd the Flock of God. Notice that there is no requirement here for a victim to face their alleged abuser. The mind boggles as to why Jehovah’s Witness leaders ever felt that was a sound process in dealing with child abuse within their ranks. What is very interesting about these forms is the fact that they require the mandated person to include their full name, address, organisation they belong to, and the position they hold. This is extremely noteworthy because it means Jehovah’s Witness elders have to provide more personal information than Watch Tower is comfortable with releasing. For example, in the State of Massachusetts, there are mandatory reporting laws. Mandated persons are required to make an oral report followed up with a written report within 24 hours. The mandated person does not have to provide any personal information except inform the authorities what position they hold (e.g. Minister of a religion). When elders are instructed to make a report in the State of Massachusetts, the Legal Department directs elders not to disclose that they are Jehovah’s Witnesses unless asked. With this new law in effect in Ireland, the Legal Department must direct elders, or any other Jehovah’s Witness who may be deemed a mandated person, to disclose that they are Jehovah’s Witnesses. Below you will find links to some of the key documents referred to in this article.